What Are Your All-Time Favourite Poems? I’ve been wanting to write a post about poetry for a very long time. In my early teens, I filled notebook upon notebook with the most awful verses. Of course, like any other angst-filled and self-indulgent teenager, I thought they were rather good. During my university studies I fell in love with a choice few poets, although I stopped writing my own poems like I had in my younger days. Now, nearly ten years after finishing university, I rarely even read poetry. To be honest, because it’s so subjective, I think I only really enjoy poetry when I’m studying it. It’s difficult for me to say what makes a poem good or bad without delving into a number of areas. Plus, I can now fully admit that I’m no poet. No sir. Rhythm. When I read it aloud, I want to hear the rhythm the way you would hear the rhythm of a song. Word choice. Shouldn’t be over-wrought, but really powerful, evocative word choice makes a huge difference. Imagery. I want to see vivid images created by the words. Layered meaning. The poem should make sense on more than one level. Context often contributes to layered meaning. Personal connection. The verse should make you think about yourself or the world around you in a new way. Most of us writers have a handful of poems that have made a difference in our lives, if only because they are forever emblazoned in our memories. Batter my heart, three person’d God… by John Donne. Favourite line: “…for I/Except you enthrall mee, never shall be free/Nor ever chast, except you ravish mee.” The final lines of this spiritual sonnet hold a thought-provoking paradox about Man’s relationship with God. Easter 1916, by William Butler Yeats. Favourite line: “All is changed, changed utterly:/A terrible beauty is born.” This one has a lot of social/historical/political context behind it. I really love the reflective and ominous tone. The Windhover, by Gerard Manley Hopkins. Favourite line: “…blue-bleak embers, ah my dear/Fall, gall themselves, and gash gold-vermillion.” Hopkins’ poem has a fascinating rhythm, and an immediacy that makes you want to keep reading. The imagery is also amazing. Neutral Tones, by Thomas Hardy. Favourite line: “A pond edged with grayish leaves.” Hardy really captures the essence of a lost relationship here. I’d be willing to bet most people can identify with these verses. You Fit Into Me, by Margaret Atwood. Favourite line: “…a fish hook/an open eye.” I love the simplicity of this 4-line poem. Short, yet so powerful. It really makes you think about how much can be said in just a few words. If you don’t already know these, I highly recommend you read them. Do you write poetry? What do you think makes a poem good or bad? What are your personal favourites, and why? « Will Literary Agents Really Read Your Query Letter? I love poetry and have always envied those who can write it. Fortunately I had teachers at high school who had a wonderful appreciation of poetry. To this day I still maintain a love of Keats, Tennyson, and others because I learned them in school. One of my favorites is by George Herbert and begins “I struck the board and cried no more…” My English teacher used to read it with a passion that could almost make me cry. Fiona, I think a good high school teacher makes all the difference in whether or not we enjoy poetry later in out lives! Fashion, faces, food…and wordplay or what I refer to as “Pose and Prose”. I up load some collected images, and then write on the fly as I post; forced poetry. When wanting to start to create, it’s good to make a date. Hi Teri 🙂 Interesting to see you’ve turned to verse of late! Hope you’re enjoying the change. Oh gosh! What a question! I grew up with 2 classic poetry books – a serious one (Palgraves Golden Treasury) and a silly one (Penguin Comic & Curious Verse) so for years I swithered betweed ‘On the Tombs of Westminster Abbey’ and ‘Macavity the Mystery Cat’. I would always say my favourite was ‘If’ by Kipling (Rudyard, not Mr) but a great modern one that sticks in my mind is ‘Shout’ by Simon Armitage (http://www.poetryarchive.org/poetryarchive/singlePoem.do?poemId=88)… and we have a great poet laureate in Carol Ann Duffy. 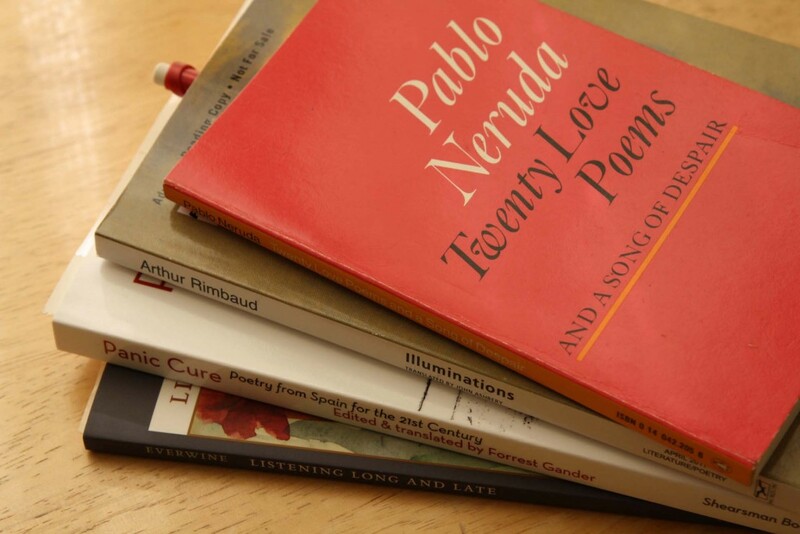 You’re asking us poets what makes a great poem? If only we had the magic recipe!! I’d suggest it has to say something important about life in an unusual way or from an unexpected perspective. Ideally it should be rich but accessible in its language and have a resonance that stays with you long after you’ve read it like someone striking a perfect note. Thanks for asking – it does make you think doesn’t it? I’d agree, “.. it has to say something important about life in an unusual way or from an unexpected perspective.” Well put! Your Favorite Donne poem and line are mine too! Love that poem. Actually, love lots of his stuff. I like Rime of the Ancient Mariner, just the imagery and the sounds. I memorized To Marguerite–continued by Matthew Arnold for my own edification, imagery and sound again. They say great minds think alike 😉 I remember studying Arnold and liking him a lot too. Thanks for sharing, Lauren! I didn’t study Dorothy Parker in school since I’m Canadian, so I’ll have to look up some of her stuff. Favorite poem of all time is Still I Rise by Maya Angelou, so powerful. Favorite poet, Sylvia Plath. I have been trying to expand my horizons again when it comes to poetry, and write a poem a day, good or bad. It helps get my thoughts in order for other writing, and is a more constructive way to journal for me than the diary method I’d fallen into. I write poetry occasionally, though I prefer prose. I love poems with imagery and metaphors. My favorite poem is probably one that appears without a title in one of my favorite books, The Perks of Being a Wallflower by Stephen Chbosky. “You Fit Into Me” is near the top of my list, and for imagery, you can’t beat Hopkins (though my fav of his is not “The Windhover,” but “God’s Grandeur”: “like shining from shook foil” and the end–“with warm breast and ah! bright wings”). I’m also addicted to Rimbaud in French, because there’s a gorgeous lulling quality to his language that completely subverts the shocking imagery. BUT my favorite poem of all time, a classic example of poetic mastery, is “Stations” by Audre Lorde. Really anything by her is amazing, but “Stations” has so many different levels and so much there to mine. I used to carry around the last stanza–“Some women wait for something to change/and nothing does change/so they change/themselves”–in my wallet. For years I’ve read and reread that poem, and I still can’t figure out if that changing at the end is a positive thing or a negative thing. And that ambiguity is present in life, emotion, reason–it’s everywhere, and it’s what makes that poem perfect.